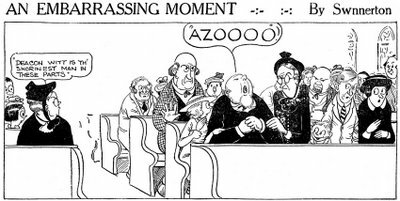 There was a well-known Hearst series titled Embarrassing Moments that ran in the 20s and 30s. 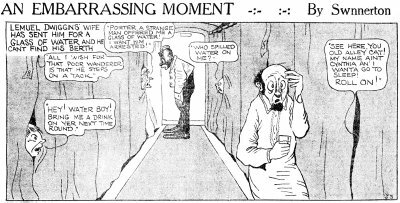 Among the luminaries that worked on that series were Billy DeBeck and George Herriman. What few people know is that it was actually a revival of an earlier Hearst series, An Embarrassing Moment. The original series started 3/2/1916 in the New York American, and was a tag team affair by A.C. Fera (better known for Just Boy, aka Elmer) and Fred Locher (Cicero Sapp). The joint effort only lasted a week, and then the series disappeared for five months (though it may have been running in papers outside New York). Locher resumed the series as a solo effort on 8/25/1916, but it was passed off just two months later to Jimmy Swinnerton (who supplies all our samples). 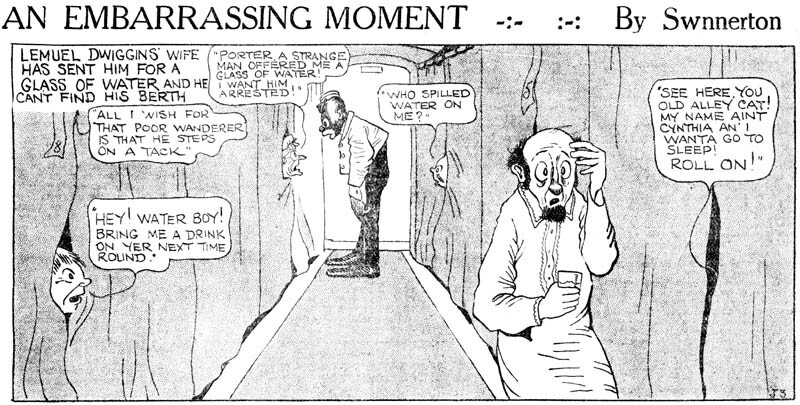 Swinnerton produced the strip until July 1917 for the American, though it ran there only sporadically. It seems to have been produced and run in other papers on a more frequent basis. The second and more famous series started sometime in 1922. Mary Hays was definitely a relative of the better known distaff cartoonists Margaret Hays and Grace Drayton, possibly a sister though no one is quite certain. Mary seems to have been younger than the other two, and certainly was not nearly as gifted artistically. 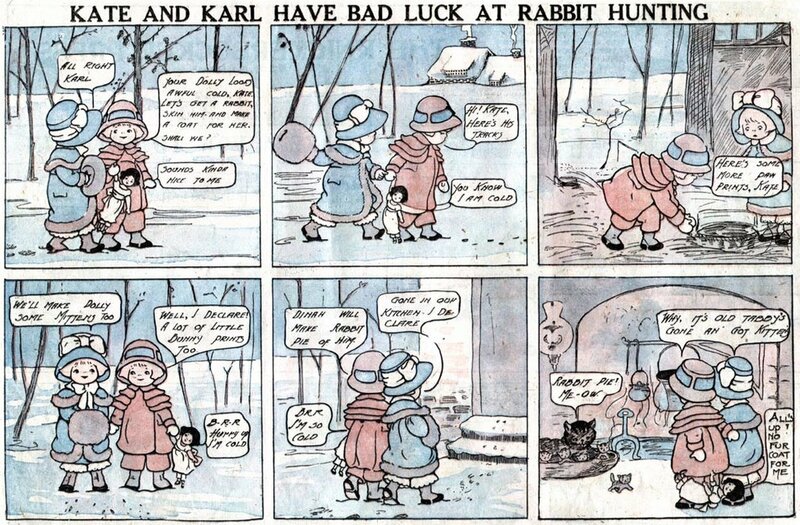 Her only long-running strip was Kate And Karl, done for the Philadelphia North American. All of the cartooning Hays clan worked at the North American in the first two decades of the 20th century, the others most notably with the long running popular series The Turr'ble Tales of Kaptin Kiddo. Mary definitely was trying to echo the style of Grace Drayton, but her version comes off as flat and lifeless by comparison. Her storytelling ability, too, leaves something to be desired as our sample attests (I had to read it three times before I could even decipher the continuity and the gag). 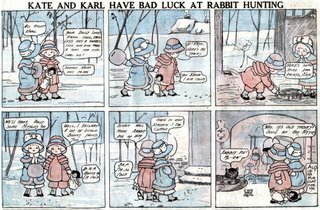 Kate And Karl ran 9/24/1911 through 11/30/1913, and was later reprinted in the World Color Printing Sunday sections of 1917-18. It's my understanding that Mary Hays went on to be a well-regarded paper doll designer. Mary A. Hays (later Mary Hays Huber) was a daughter of Margaret Gebbie Hays, and a niece of Grace Gebbie Wiederseim Drayton (Margaret and Grace being sisters). In her early career Mary hadn't come into her own artistically, but she was very young! She later designed/illustrated a good many items for the Dennison and Gibson companies; the companies neither credited their artists nor kept a record of their names. I have seen her name on a couple of children's magazine pages, one of which I own, and I have seen just her initials (MH) on one Gibson postcard which is recognizably in her style (and which I also own). I realize that postcards, bridge tallies, and holiday stickers aren't your primary interest, but I thought you might enjoy having some of the information I've been able to glean over the past few years. I'm always thrilled when readers write with additional info about these cartoonists. So many of them are ciphers to me, it's great to hear about their other endeavors! In mid-1912 the Rocky Mountain News ran Chris and Christena's Courtship as sort of a banner on the front page of their Sunday classified section. I have a run of the strip from July through August, but it may well have run longer. Notice that this strip is in (limited) color, even though it ran in what is normally a black-and-white section of most papers. The papers of Denver (the Post, the Times, the Republican, the Express, the Rocky Mountain News and perhaps even others) were in a pitched battle for circulation, though, so many of the papers brightened their paper with a liberal use of color. The color extended to the news coverage as well -- the Denver papers of the 1900s-1910s are some of the yellowest journals you'll ever find. If you're a fan of sensational newspapers like I am, you'll find nirvana in the pages of these old Colorado papers. I don't know whether this strip originated at the News or if it was syndicated from elsewhere. 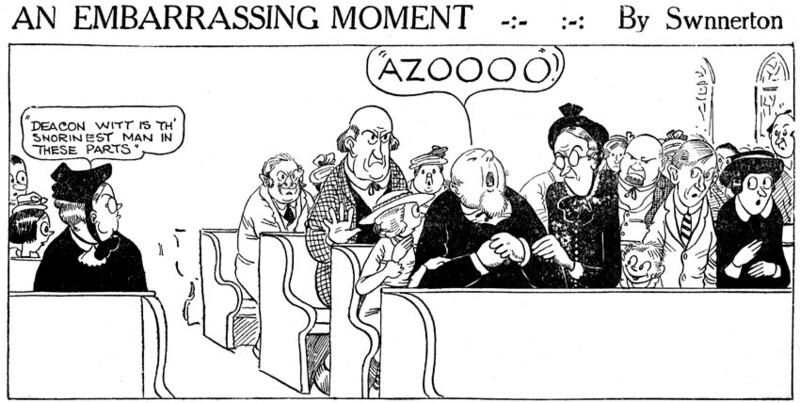 The cartoonist Artigue has a few comic strip credits in Boston and Philadelphia in the 1906-09 period, but I lose track of him after that with this one exception from 1912. Can anyone offer more information on either Artigue or this strip? Can You Find the Lost Kirby Strips? As promised a few moons ago on this blog, I have been looking for the list of newspapers given to me by Greg Theakston. These newspapers are supposed to have run Jack Kirby's ultra-rare material for the Lincoln Features Syndicate. Though we've found a few papers now running Lincoln material, most of the more interesting Kirby work (like Socko The Sea Dog, Cyclone Burke and The Black Buccaneer) are still only know from proofs in the collection of Roz Kirby. Did you ever find a paper running Socko the Seadog? The Old Fulton site has some samples from the Attica News and the Cayuga Chief. Go to http://fultonhistory.com/Fulton.html and do an exact search for Socko the Seadog.